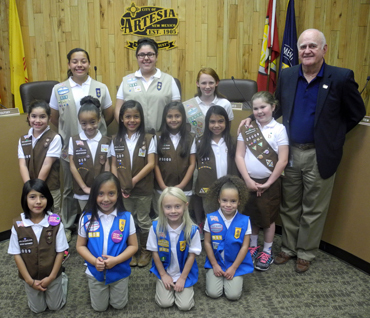 Artesia Mayor Phillip Burch, right, delivers a proclamation Tuesday declaring March 6-12 as Girl Scout Week in Artesia. March 12 marks the 104th anniversary of Girl Scouts of the USA, founded by Juliette Gordon Low in 1912 in Savannah, Ga. “I do hereby applaud the commitment Girl Scouting has made to America’s girls,” said Burch. Pictured from left are, top row, Raquel Garcia, Syann Perez, Brooke Wilson, center row, Aubree Ortega, Amya Sentell, Alani Garcia, Mireya Fabela, Bella Salazar, Rian Duncan, Burch, bottom row, Felicity Padilla, Evelyn Frescas, Lilian Chumbley and Kiva Sentell.